The constant flux of tides in the Manukau Harbour is central to the performance art work created by Brinsden, the Cardwell Art Collective, and students of Onehunga Primary School. 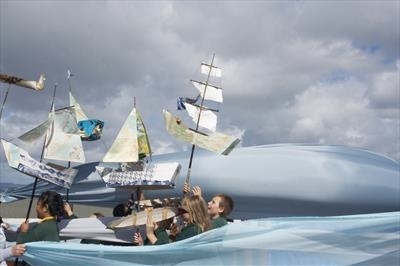 The child-focussed performance event on Old Mangere Bridge by the school participants pays tribute to the sinking of the HMS Orpheus on the Manukau Bar on the 7th February 1863 and the subsequent rescues of sailors by waka. The project acknowledges the differing cultural perspectives on this event. The artwork is developed in a collaborative process with children from Onehunga Primary School and The Cardwell Art Collective–a local community art group–who will traverse the bridge.